Imagine every time you buy a nutritious, frozen meal at a grocery store, that same meal is made more affordable to someone in need. 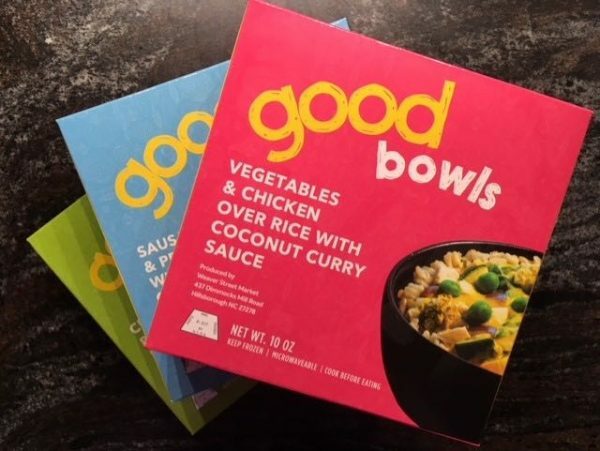 That’s the idea behind Good Bowls, a new public health initiative lead by nutrition professor at UNC Alice Ammerman: a healthy, locally sourced, frozen meal that is offered at a sliding scale. Consumers willing to pay a few dollars more for the listed price at one location make Good Bowls more affordable for those with less means. “Because healthy, locally sourced food is appealing to both high-income and low-income consumers, we’re making the same product and selling it for a higher price at stores where people who have more means may be shopping,” says Ammerman. Ammerman calls these “socially conscious consumers with means,” and they are what make the business model behind Good Bowls work. Paying a little extra for a Good Bowl means that lower-income shoppers can afford healthy, nutritious produce without cutting into local farmers’ profits. Ammerman is working with groups like Farmer Foodshare and Hungry Harvest to make sure that this model is sustainable for the local farming community as well. “We’re lucky that there are those organizations that are making that a lot easier than trying to reach out to individual farmers and organize that,” says Ammerman. While Good Bowls are already available at premium grocery stores like Weaver Street Market and the Durham Food Co-op, along with corner stores across Durham and Warren County, the group is hoping to work with more commercial kitchens across the state to create a wider reach. “A lot of my work has involved some of the federal food programs like [Women, Infants, and Children] and SNAP, so I knew that we wanted to make it eligible for that,” says Ammerman. More information is available at the Good Bowls Facebook page.